The first “saleable” harvest from Canadian cannabis giant Aurora’s Nordic 1 facility in Denmark is expected to be ready by the end of first quarter 2019, the company disclosed in a regulatory filing released alongside its quarterly earnings this week. Products would be available the following quarter. Aurora is one of the Canadian cannabis firms racing to establish a cultivation foothold in Europe to tap the continent’s considerable growth. Sales of medical cannabis overseas – especially in Europe – are a big part of the value proposition for many Canadian marijuana companies. Aurora’s sales of medical cannabis in the European Union for the second fiscal quarter of 2019 amounted to 3.2 million Canadian dollars ($2.4 million), an increase of CA$100,000 – and 43,153 grams (95 pounds) – from the previous quarter, the company disclosed. Europe accounted for about 6% of Aurora’s net revenue in the quarter and Canada for 92%. 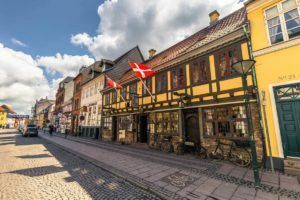 Aurora Cannabis announced initial plans for a 200,000-square-foot facility in Denmark in January 2018, which was downsized to 100,000 square feet three weeks later. The second phase – Aurora Nordic 2 – is under construction. Aurora anticipates it will provide an additional of 100,000 annual kilograms of medical cannabis when complete in 2020. Aurora trades as ACB on the New York Stock Exchange and Toronto Stock Exchange.